Background: INI1 (hSNF5) mutations are linked to rhabdoid tumours, but mutations in meningiomas with hot spot mutations in position 377 have also been reported. Aims: To analyse the INI1 gene in meningioma. Methods: Exons 1, 4, 5, and 9 of the INI1 gene were analysed by the polymerase chain reaction and direct sequencing in 80 meningiomas. 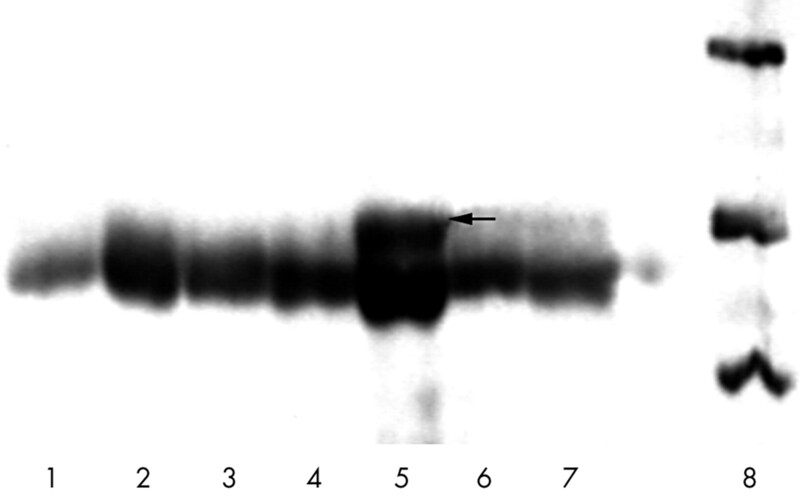 For all cases, western blotting of the INI1 protein was performed. Results: Only one of the 80 samples showed a cytosine insertion in codon 376. This mutation changed the open reading frame in almost the whole exon 9 and resulted in a longer hSNF5 protein. Complex analysis of the above described tumour sample by western blotting, DNA sequencing, and loss of heterozygosity (LOH) analysis showed that this particular meningioma consisted of heterogeneic cellular components. One of these components had a mutated INI1 gene, whereas in the other component INI1 was intact. Conclusions: INI1 mutation is a rare event in the molecular pathology of meningiomas. It is possible for the INI1 gene to be mutated in only a proportion of meningioma cells. Samples of tumour and corresponding DNA from peripheral blood leucocytes used in our study were obtained from patients who had undergone surgical resection in the department of neurosurgery, Polish Mother’s Memorial Hospital, Lodz, Poland. All tumours were examined histopathologically and classified according to the World Health Organisation classification of tumours of the central nervous system.8 DNA was isolated by means of chloroform phenol extraction. The polymerase chain reaction (PCR) was performed under standard conditions, using dNTPs (Perkin Elmer, Boston, Massachusetts, USA), Taq DNA polymerase (Promega, Madison, Wisconsin, USA), and a Biometra UNO Thermoblock (Biometra, Gottingen, Germany). Exon 1 forward primer, 5′–ATT TCG CCT TCC GGC TTC GGT TT–3′. Exon 1 reverse primer, 5′–ATG AAT GGA GAC GCG CGC TCT–3′. Exon 4 forward primer, 5′–TCA GGT CCT ATA CTG ACT GG–3′. Exon 4 reverse primer, 5′–AGA ACT AAG GCG GAA TCA GC–3′. Exon 5 forward primer, 5′–GCT TCC ATT TCA CTT TCA GC–3′. Exon 5 reverse primer, 5′–GTT CCC ACG TAA CAC ACA GG–3′. Exon 9 forward primer, 5′–TGT TCC CAC CCC TAC ACT TG–3′. Exon 9 reverse primer, 5′–ATG AAT GGA GAC GCG CGC TCT–3′. Sequencing was performed by means of an automatic sequencer from LiCor (Lincoln, Nebraska, USA). DNA was amplified as described above. PCR products were precipitated with glycogen. The sequencing reaction was performed by means of the Epicentre (Madison, Wisonsin, USA) sequencing kit in accordance with the manufacture’s protocol. Products of the sequencing reaction were visualised and analysed with the LiCor automatic sequencer. Exon 1, 5′–CTG ATC CCT CGC AGC CCG G–3′. Exon 4, 5′–CAC GGA GGG TGA GTG CAG–3′. Exon 5, 5′–GGC CAG GCC CAG CCA AGC C–3′. Exon 9, 5′–TCT GAG ATG CTC CGT GGG AG–3′. LOH analysis was performed only for the meningioma with the INI1 mutation. The D22S1163, D22S298, D22S257, D22S303, and D22S268 markers overlapping the hSNF5 gene were used. Among them, D22S303, D22S1163, and D22S268 were informative. The LiCor automatic sequencer was used to determine LOH. LOH was scored in the case with INI1 mutation because the allelic signal intensity of the tumour sample was reduced by more than 70% compared with the corresponding allele in the patient’s control DNA. Protein samples were obtained from frozen tumour tissues. Samples were resolved on 12% sodium dodecyl sulfate polyacrylamide gels, transferred to PVDF membranes, and reacted with the anti–INI1 antibody N–14 (sc9749) C–18 (sc9751) (Santa Cruz Laboratories, Santa Cruz, California, USA) at a 1/1000 dilution. 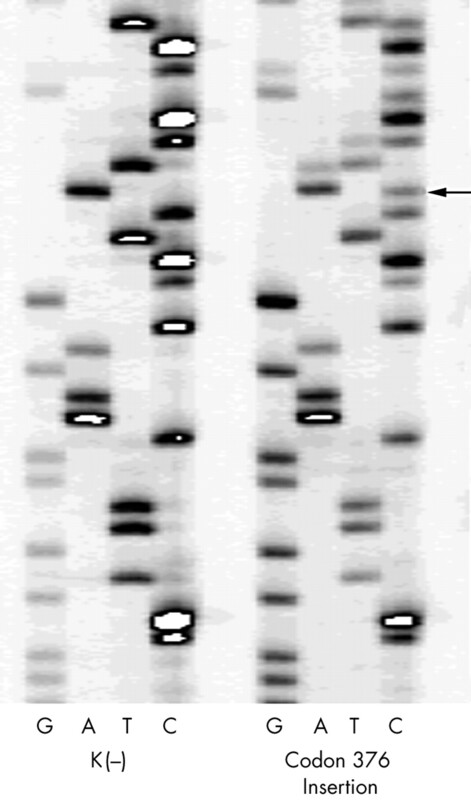 In addition, after stripping, an actin specific antibody (actin C–2 sc8432; Santa Cruz) at a 1/1000 dilution was used to visualise potential differences in protein concentrations and protein degradation. Only one of 80 meningioma samples showed a mutation in the INI1 gene. Histological examination of this tumour specimen revealed transitional meningioma. 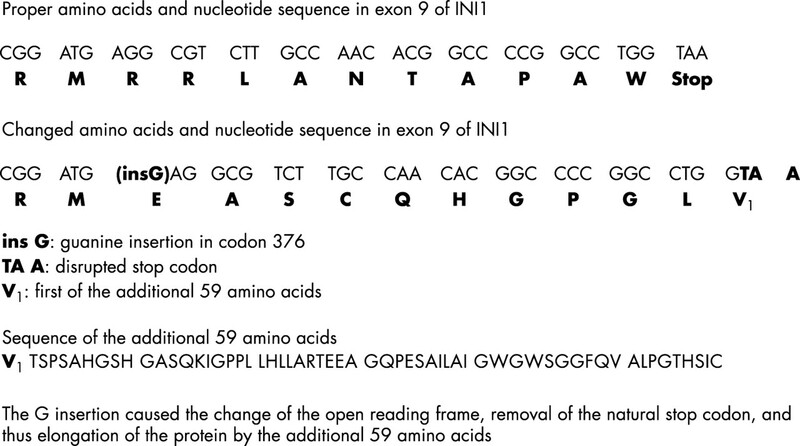 The INI1 mutation was different from that described before in meningiomas.2 The mutation changed the open reading frame of exon 9, resulting in the removal of the normal stop codon and elongation of the INI1 protein by an additional 59 amino acids (fig 1). Sequencing indicated that the mutation was heterozygotic (fig 2). However, taking into consideration the fact that heterozygotic mutations are characteristic of oncogenes rather than of tumour suppressors genes, two other explanations for the sequencing result may be offered. First, contamination of the tumour sample with normal, not neoplastic, brain tissues and, second, molecular heterogeneity of the analysed meningioma. Data base analysis of the novel 59 amino acid sequence showed no significant homology with a known protein, making the hypothesis that the observed mutation causes gain of function untenable. In addition, LOH analysis performed for chromosome 22q in the mutated meningioma showed LOH for a chromosomal region overlapping hSNF5 (SWI/SNF related, matrix associated actin dependent regulator of chromatin position). This positive LOH result eliminated the possibility of contamination with normal tissue. Thus, both the sequencing and LOH results could be interpreted only as a consequence of molecular heterogeneity of the meningioma sample. Western blotting analysis of the tumour sample with the INI1 mutation showed that it had a longer protein product compared with other meningiomas. This supported the notion that mutated INI1 was present in less than 50% of the meningioma cells (fig 3). Molecular heterogeneity of tumours is a frequent phenomenon.9 This is the first observation of such heterogeneity with regard to the INI1 gene in meningiomas or elsewhere. Molecular mechanisms of INI1 mutation in the case of meningioma described here. Cytosine insertion in codon 376 causes the appearance of double bands, starting from the point of mutation. Western blotting analysis of several meningiomas. Anti–INI1 antibodies raised against the N–terminal end of the INI1 protein were used. Lanes 1–7, meningioma cases. Lane 5, meningioma with mutation, which produces a longer INI1 protein. Lane 8, molecular weight marker. We did not find the INI1 mutations described by Schmitz et al in meningiomas.2 However, similar to an earlier report, our mutation affected the C–terminal arginine rich region of INI1.2 In this region, Craig et al have described a hypothetical domain masking the nuclear export signal sequence (NES).10 Unmasking of the NES causes INI1 to be exported from the nucleus to the cytoplasm, where INI1 is unable to perform its function.10 We confirmed that INI1 mutation is a rare event in the molecular pathology of meningiomas. In addition, we found that INI1 can be mutated only in a proportion of meningioma cells. Schmitz U, Mueller W, Weber M, et al. INI1 mutations at a potential hotspot in exon 9. Br J Cancer2001;84:199–201. Yuge M, Nagai H, Uchida T, et al. hSNF5/INI1 gene mutations in lymphoid malignancy. Cancer Genet Cytogenet2000;122:37–42. Manda R, Kohno T, Hamada K, et al. Absence of hSNF5/INI1 mutation in human lung cancer. Cancer Lett2000;153:57–61. Zhang F, Tan L, Wainwright LM, et al. No evidence for hypermethylation of the hSNF5/INI1 promoter in pediatric rhabdoid tumors. Genes Chromosomes Cancer2002;34:398–405. Ruttledge MH, Xie Y–G, Han F–Y, et al. Deletions on chromosome 22 in sporadic meningioma. Genes Chromosomes Cancer 1994;10:122–30. Peyrard M, Fransson I, Xie Y–G, et al. Characterization of a new member of the human beta–adaptin gene family from chromosome 22q12, a candidate meningioma gene. Hum Mol Genet 1994;3:1393–9. Kleihues P, Louis DN, Scheithauer BW, et al. The WHO classification of tumors of the nervous system [review]. J Neuropathol Exp Neurol2002;61:215–25;discussion:226–9. H Fujii, Y Ajioka, S Kazami, et al. Loss of heterozygosity in the clonal evolution of flat colorectal neoplasms. J Pathol 2002;197:298–306. Craig E, Zhang ZK, Davies KP, et al. A masked NES in INI1/hSNF5 mediates hCRM1–dependent nuclear export: implications for tumorigenesis. EMBO J 2002;21:31–42.